Portable propane heaters come in several different designs, each with its own advantages and disadvantages. Some use the small, disposable "camp stove" type canisters, and the larger ones use 20 lb. (barbecue grill size) or larger refillable propane canisters. They can be designed to provide radiant heat, convection heat, or both. Radiant or infrared heat is the type of heat that is provided by the sun. It warms objects that are in its "line of sight" through infrared light, and does not rely on air to carry the heat energy. Convection heat is what is used in most homes today. The heater or furnace is used to heat the air, and the warm air is then distributed either by natural air currents or by a fan. 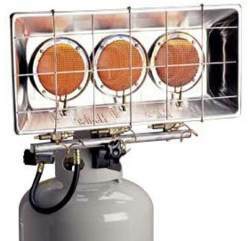 Tank top heaters are the simplest and least expensive type of portable propane heaters. A tank top heater is essentially just a burner that mounts directly onto a propane canister. These provide radiant heat of up to 42,000 BTUs with a triple burner design. They are designed for outdoor use only, and are useful if you keep the garage door at least partially open or are working in a carport or your driveway. There are free standing (as opposed to tank top) radiant type units available also. Some of them are directional, while others actually provide warmth in all directions. The smaller ones use a common 20lb. propane canister, but some larger ones require a 60lb. or even a 100lb. canister. Some of these can provide well over 100,000 BTUs of heat per hour. The Buddy heater is another type of portable heater with the emphasis on "portable". The Little Buddy only uses the disposable 1 lb. propane canisters, but the Portable Buddy and the Big Buddy heater can be connected to a 20 lb. cylinder. The Big Buddy heater can warm up to 400 square feet at 18,000 BTUs per hour. The most popular type that uses convection is the torpedo heater, also called a salamander heater. These are basically a tube with a blower in one end and a propane burner inside. They usually require a 110v connection for the fan to operate. The torpedo heater is useful for warming up large areas very quickly, and is popular for use on construction sites. There are also models available that use natural convection only instead of forced air. Convection heaters won't warm up a large area as quickly as the torpedo heater does, but they do not require electricity either. I have to caution you though that most portable propane heaters are not very suitable for use in a closed garage. Most of them are labeled as safe for outdoor use only. The ones that are listed as safe for indoor use have very explicit instructions about ventilation requirements. Some recommend that the space being heated have a partially open window, or even better, an opening on one side near the floor and an opening on the opposite side near the ceiling to get a constant flow of fresh air. Another reason that many propane heaters (portable or not) are not well suited for a garage is that they are not safe in environments with flammable vapors. A typical garage will have a number of different flammable vapors present at one time or another, including gasoline, paint thinner, carburetor cleaner, and other solvents. "FOR OUTDOOR USE ONLY. DO NOT USE OR STORE CYLINDER IN A BUILDING, GARAGE OR ENCLOSED AREA". OOOPS! The reason for this is that if the canister should develop a leak, all it would take is one spark to create one heck of a fireball. If the canister should happen to explode, the force could level your entire home. All of the manufacturers of propane portable heaters warn you that any refillable canister MUST be located outdoors, even for indoor propane heaters. My cylinders are now stored outside in an open shed. Portable propane heaters are still a viable option if your garage is well ventilated, you turn them off when other flammable vapors are present, and you remember that the canister must be stored outside. They are best suited for temporary or short-term heating. Many of the manufacturers have the owners manual posted on their website, and it is a good idea to read the manual before buying one. There are lots of different models to choose from. Amazon has owner reviews of many of the more popular portable propane heaters, so they are a good resource to check out before you buy. For more information on different types of heaters, go to our Related Pages menu on the right near the top of this page.